Seresto Dog Flea & Tick Collar provides 8 month prevention and treatment of fleas and ticks on small dogs and puppies 7 weeks of age and older and up to 18 lbs. Inside the unique polymer matrix of Seresto are two active ingredients, Imidacloprid and Flumethrin. Imadacloprid has been used in products recommended by vets for years to control flea infestations and flumethrin works to repel and kill ticks. Seresto works similarly to a monthly topical, but as the active ingredients wear off over time, a new supply is continuously replenished in low concentrations. Bayer's polymer matrix technology is designed to slowly and continuously release the active ingredients over 8 months. Monthly flea and tick treatments can be time-consuming to apply. Plus, remembering to apply them monthly can be a hassle. Seresto takes just minutes to adjust on your dog, and provides treatment that lasts eight months against fleas and ticks. Seresto kills fleas within 24 hours and kills ticks within 48 hours of initial application. Water resistant collar. Quickly kills fleas on dogs within 24 hours and continues to prevent infestations for 8 months. Treatment with Seresto kills fleas and may reduce the risk of tapeworm infections (Dipylidium caninum), bartonellosis (Bartonella vinsonii, Bartonella spp. ), and rickettsiosis (Rickettsia felis), which are types of canine vector borne diseases). 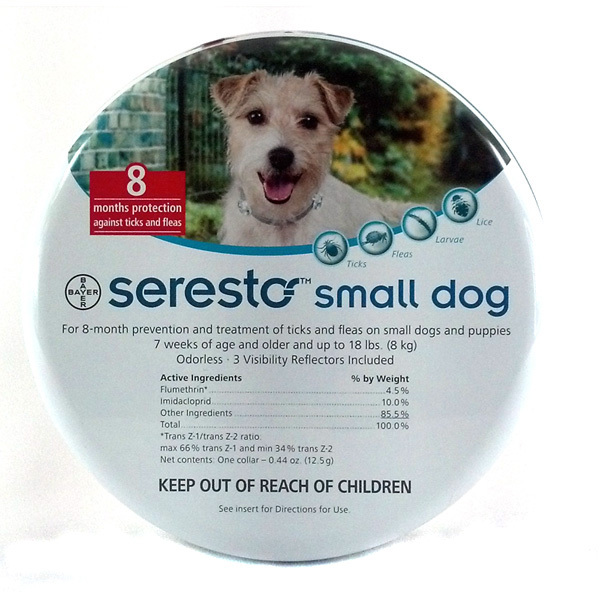 Seresto aids in the control of flea larvae in the dog�s surroundings following contact with a Seresto-treated dog. Kills chewing lice for one month. Aids in the treatment and control of Sarcoptic mange. Bayer Polymer Matrix ensures that both active ingredients are slowly and continuously released in low concentrations. Make sure to replace the collar after 8 months for year-round pest prevention. This product Ships Free via Economy shipping for orders to the 48 contiguous states or USPS 1st Class Mail to HI, AK, PR, GU, and APO/FPO addresses. Buckle-free design is helpful. Convenient, safe (relative to similar products) and effective product. ProsContains imidacloprid, which is more toxic to insects than to mammals. Great Prices for a great product. Saved lots compared to other sites or the vet. Highly recommend this product. I have seven dogs and I would go broke trying to do each with any of the brand name topicals. I usually replace the collar in the spring and give their systems a rest over the winter. No mess, no chemicals, directly on their skin and no fleas or ticks. I also like the reflectors provided for the collar. Used this product on 2 dogs and 3 cats last year with great results. No messy liquid to apply. No need to remember to apply a topical every month. We have a lot of ticks in my area. This product not only kills the ticks that happen to get on the dogs, it also repels most of them in the first place. Used this on recommendation from my vet. Really good not to have to remember to dose the dog every month. It works well. I haven't found a tick on her ever since we put the collar on. Does as promised. No fleas, and ticks just fall off. ConsTakes a week or so to kick in the first time you use one, but after that, it's done. Bought for my dog last year and she never had a flea/tick! ProsIt works for 8 months! After about 2 years of a constant flea battle... we tried everything on the market (Frontline, Advantage, Comfortis, Trifexis, etc.) in combination with bombing and yard spraying, I finally was recommended the Sseresto flea collar. I figured, why not? For it's price I decided to only get 2 collars at first. (We have 3 dogs and 2 cats). Withing 24 hours, we saw a drastic decline in the number of fleas in the house. Of course we had it at a disadvantage with 3 animals for them to still feed on. I went ahead and got 3 more collars. 24 hours later, NO FLEAS. We came across a couple of fleas in the following days, but they were obviously dying and begging to be put out of their misery. lol. One of my cats had a sensitivity to fleas. Her skin was always inflamed and red and she was missing half her fur. Within a few weeks, her skin healed and was growing back a beautiful fluffy coat again. This is the best product i have bought in a long time. and if it lasts the 8 months it claims, it is a bargain. Try it, you won't be sorry! I run a pet sitting business and I have been boasting about it to my clients and on social networks. Love love love love it!